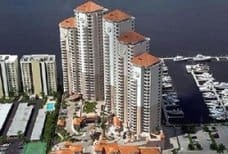 Search Fort Myers,FL, High Rise condo listings by price! The Fort Myers area offers a wide variety of locations. From Fort Myers to Fort Myers Beach. The high rise condos have views of the Caloosahatchee River, City Views, and views of the Gulf of mexico . Use your fun in the sun time enjoying southwest Florida’s white sand beaches or cultural venues. There are many architectural styles of condos to choose from. The Fort Myers area has great shopping, parks, and entertainment. The Boston Red Sox and Minnesota Twins have spring training in Fort Myers. Back to Fort Myers High Rise Condos home page.